HOUSTON -- Cleveland manager Terry Francona enjoys facing the top teams in baseball. He likes it even more when his team gets the best of one of them. 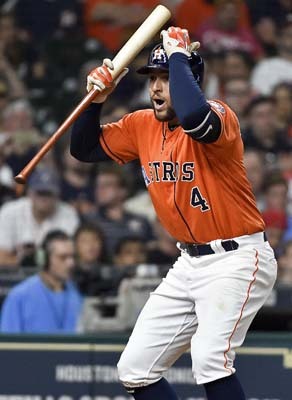 Edwin Encarnacion hit a two-run homer and Jason Kipnis and Lonnie Chisenhall had solo shots to help the Cleveland Indians to a 5-3 victory over the Houston Astros on Friday night. "They're dangerous. 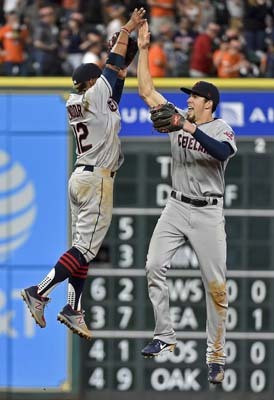 They present a lot of problems," Francona said of the Astros, who have the best record in the majors at 29-13. "That's why we're looking forward to playing. Because it's fun playing teams like this because they're good." Cleveland starter Trevor Bauer (4-4) continued his dominance against Houston, yielding five hits and three runs while fanning a season-high nine in 5 2/3 innings to improve to 7-0 in seven career starts against the Astros. "He got us to a point in the game where you're not asking the bullpen to do more than they're supposed to," Francona said. "And our bullpen did a really good job." Cleveland's bullpen threw 3 1/3 scoreless innings capped by a perfect ninth by Cody Allen to help the Indians improve to 14-0 when leading after six innings. Allen has converted each of his 11 save opportunities this season and 20 in a row dating to Aug. 18. Bauer couldn't explain why he's been so good against the Astros. "I don't know," he said. "I just happen to be on a good run right now I guess. It will turn around at some point too. It's not always going to be that way. So enjoy it while it's going my way." Encarnacion's home run off Charlie Morton (5-3) tied it at 2-all in the fourth and Kipnis gave the Indians the lead with his home run in the fifth. Chisenhall made it 4-2 with his homer in the sixth before Carlos Correa got Houston within one with a home run in the bottom of that inning. Chisenhall sent home another run with a sacrifice fly in the eighth that pushed the lead to 5-3. Morton tied a season high with eight hits and the three home runs he gave up tied a career high. He allowed four runs in 5 1/3 innings for his first loss since April 22 to snap a four-game winning streak. It was only the second time he's allowed three home runs in his career, and the first since April 14, 2010, against the Giants. "He seemed to always have to deal with some sort of mess, some of it his own, some just some really good hitting from the Indians," manager A.J. Hinch said. "We were trying to get him through that sixth inning hurdle that has been troublesome for him. All in all, he kept us in the game. I don't think he was at his best, and he fought through a little bit of delivery issues." 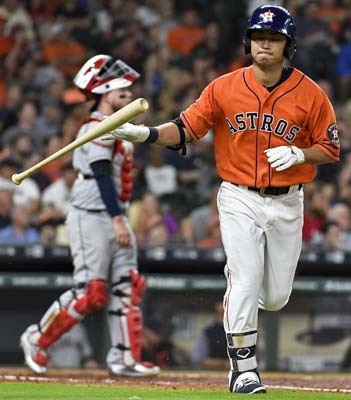 Josh Reddick added a solo home run in the third for the Astros, who lost for just the second time in 11 games. .
Bauer settled in after Reddick's home run, retiring the next 10 batters with six strikeouts before Correa's home run with one out in the sixth. Indians: OF Austin Jackson (toe) went 1 for 3 with a two-run homer in the first game of a rehabilitation assignment at Triple-A Louisville on Friday night. He'll play there on Sunday and Tuesday before being re-evaluated. ... RHP Corey Kluber (lower back strain) will throw a simulated game on Saturday. Francona said he'll throw at least 45 pitches, but it could be more depending on how he feels. The Indians will decide what his next step is after they see how he comes out of Saturday's work. 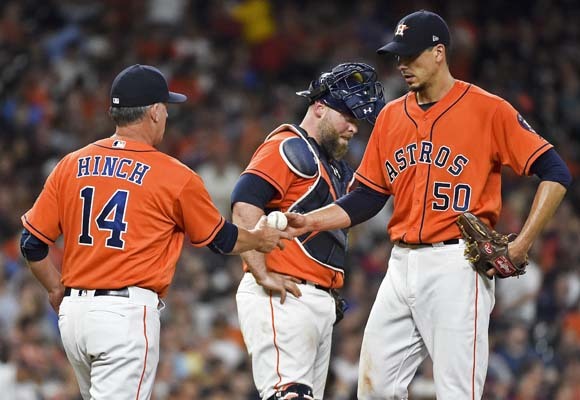 Astros: RHP Collin McHugh, who hasn't played all season because of an elbow injury, is making steady progress, but Hinch said he is unlikely to return to the team before the All-Star break. 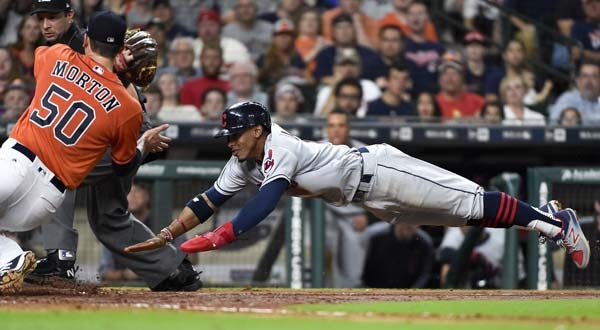 Lindor robbed Jose Altuve of a hit in the sixth inning when he grabbed his grounder, made a 360-degree turn and two-hopped the ball to just beat him to first base for the first out of the inning. 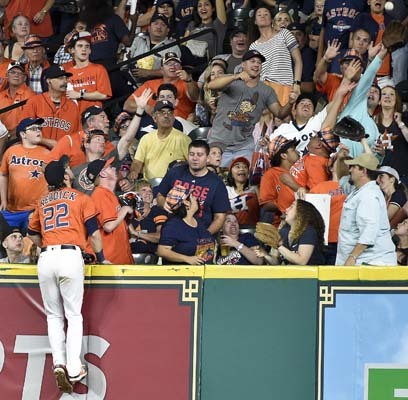 It proved to be a big play with Correa's home run coming after Altuve's at-bat. "Frankie plays a really good shortstop. He's athletic," Francona said. "There's some good ones but he's right there. That's a heck of a play before the ball goes out of the ballpark makes it even bigger." Morton on his struggles later in games: "Execution has to be better. I have to establish a second pitch, if not a third pitch the third time through." Indians: Mike Clevinger (1-1, 2.70 ERA) is scheduled to start on Saturday for Cleveland. Clevinger will pitch on three days' rest after throwing 1/3 inning of relief on Tuesday. Astros: Mike Fiers (1-1, 5.75) will start for Houston on Saturday. He didn't factor into the decision after allowing four hits and four runs in 5 2/3 innings of an 11-6 loss to the Yankees in his last start.